One of the worst things you can do as a website owner is let your domain expire. Fear Not! We got a perfect solution to all your problems related to domain & SSL expiration. Support & Updates for a Lifetime. Isn't it wonderful?? Get This DEAL Now! Receive domain expiry notification right to your inbox. DomainFox will send a notification to everyone in your team. Are you away from the internet? 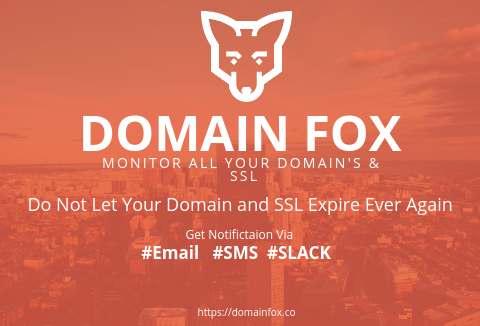 Don't worry, DomainFox will send the notification right to your mobile. Do you feel your day incomplete without Slack? You can receive the notifications via Slack. Domain and SSL expiry notification service for teams. Get automatic reminders for team members. Notification via Email, SMS, and Slack. You will receive unique URL along with coupon code to redeem on DomainFox website. 20 Domains with $20 for life. Lifetime support and updates will be provided. DealClub Member?? Grab it at $15 only!